The Ibeji are the divine twins. They bring joy, happiness and abundance to their followers. The Ibeji (also called Ibelli, Ibeyi, Meji, Melli or Jimaguas) is the orisha of the divine twins. While there are two individuals when twins are born, the Ibeji is one orisha. Twins are considered sacred by birth among the Yoruba people. The Yoruba people have one of the world’s highest rates of twin birth (average world rate of twins is 0.5% where the Yoruba people have a 5% twin birth rate!). The Ibeji (and all twins for that matter) are considered one soul contained in two bodies; inextricably linked in life through destiny. The Ibeji are the orishas of joy, mischief, abundance and childish glee. They are the children of Chango and Oshun and are considered to be the first twins born on the Earth. Pataki: When Oshun gave birth to the Ibeji, she was shunned by the people who lived in her village. Only animals gave birth to multiple babies until then, so they branded Oshun a witch and cast her out of the village. Oshun, in her short-sighted panic, threw the Ibeji out of her house and denied being their mother. This proved to be the start of Oshun’s downward spiral eventually leading to her loss of all wealth, stability and eventually even losing her sanity. The Ibeji were taken in by the orisha Oya who had desperately wanted children her entire life but was barren and had only had stillborn children. Some lineages vary and say that Yemaya took the Ibeji in and raised them. 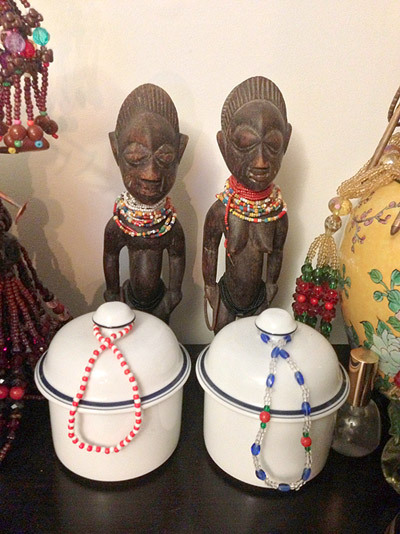 The Ibeji are said to bless anyone who receives them with happiness, joy, abundance and laughter. There is even a Cuban pataki that says the Ibeji drove away “the devil” (misfortune) by driving him crazy through playing their enchanted drums. The Ibeji are considered the tutelary orisha of anyone who is born a twin, including those who have lost their twin sibling. In Yoruba society, when a mother gives birth to twins, Ibeji are consecrated and given to her as well as a set for her twin children. If one of the twins dies, a special doll is consecrated to act as a body for that deceased child’s sibling to carry (So that the two-bodied soul of the twins can remain intact. Otherwise the surviving twin would quickly follow his or her sibling to death.). When the second twin dies, a second doll is consecrated to match the first and both are kept with the consecrated pots by the mother. This tradition is what evolved into our tradition in Santeria Lucumí, where the Ibeji are received with two pots containing the mysteries and two consecrated dolls to accompany them. The first born twin of the Ibeji is considered the younger of the two and is named Taewo. The second born is considered to be older and is named Kehinde. Taewo is dressed in red and white, and Kehinde is dressed in blue and white. There are lineage variations in the genders of the twins, but at the Santeria Church of the Orishas, we consider Taewo to be a boy and Kehinde to be a girl. It is common for aborishas to receive the Ibeji, while others receive the Ibeji in their kariocha. Many people receive the Ibeji as an orisha addimu as indicated in a diloggún reading, while others never even receive the Ibeji. It is important to remember that the Ibeji are not a required orisha to receive before kariocha. But it is common for people to have received them by the time they crown ocha. It is a traditional practice to have an annual party in honor of the Ibeji where children are invited, cake is served and games are played by all who attend (and even adults let their inner kid out to play). While many orishas have roads or caminos, Ibeji do not. They are universal in nature. There are some variations in lineages where some ibeji are of the same gender, but most are typically opposite gendered (male and female). Ibeji eat all kinds of fun, kids’ foods, sweets or things served in pairs. These include tiny bananas (called manzanos), fruit of all types, cakes, candies and their favorite dish of arroz con pollo (chicken and rice). Ibeji’s animal sacrifices include chickens and pigeons. One of the simplest offerings you can give the Ibeji are hands of manzano bananas. These tiny finger-sized bananas come in fan-shaped bunches called hands that are occasionally available from specialty grocers or Asian markets. Simply purchase two hands of the manzanos and offer one to each of the Ibejis. Leave this offering for as long as divination has indicated then dispose of it in the proper place in nature as dictated through divination. Hands-down the most common cooked food addimú for the Ibeji is arroz con pollo. This traditional Cuban dish of rice with chicken is delicious, hearty, and is often served at the annual party held in honor of the Ibeji. There are countless variations on how to cook arroz con pollo. I recommend you look up a recipe on any of the online recipe archives (like epicurious.com or food.com) to make arroz con pollo. When you are ready to serve it, place the food in one bowl and offer it to both of the Ibejis by placing their pots on a straw mat (estera) then placing the bowl in front of their pots. Leave the offering there for the proper amount of days then dispose of it as indicated through divination.